With the SAP-certified Bizagi SAP connector, you can integrate your SAP ERP systems from Bizagi processes. Bizagi lets you manage information of the external systems and applications integrated in the Processes for testing or production environment, as described at External systems administration. 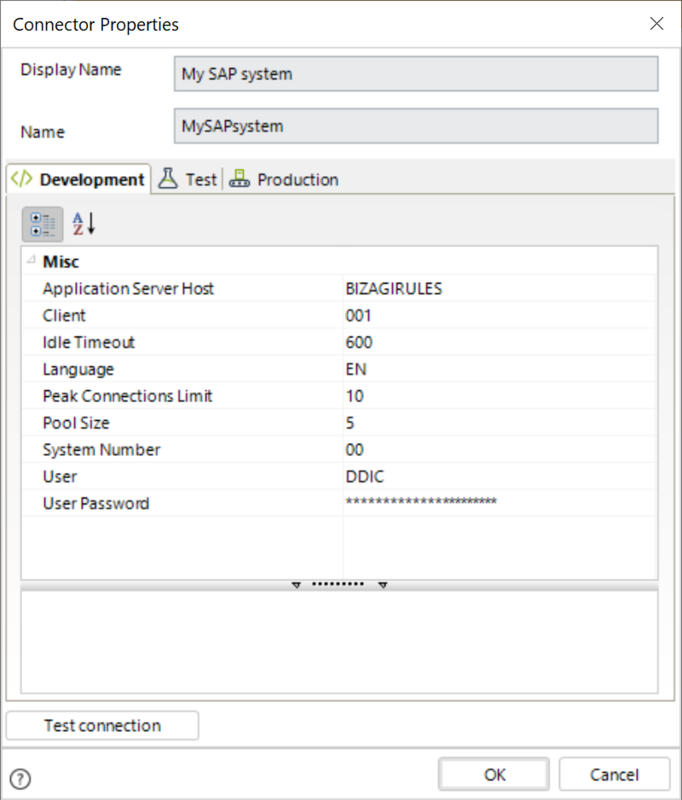 Edit the connection parameters of your SAP system by locating the SAP connector item in the External systems module. If any of these parameters changes in your SAP system, you can edit them in Bizagi for your specific environment (test or production). •Application Server Host: The IP address or name of your server hosting your SAP system. By default, you can assign a value of 600. •Language: The 2-letter ISO code that represents the language setting (as input when accessing SAP through SAP Logon). •Peak connections limit: The maximum number of connections you allow through the SAP connector. By default, you can assign a value of 10 connections. By default, you can assign a value of 5.